Antibiotic-resistant superbugs have been called “the greatest threat to civilization” by England’s chief medical officer. Headlines warn of outbreaks of MRSA and other deadly bacterial infections obtained in hospitals. But surprisingly little attention has been given to what is likely the primary source of these superbugs — factory farms. While antibiotic overuse in humans is definitely a problem, it pales in comparison to the amount of antibiotics used in industrial agriculture. Farm animals are fed nearly 25 million pounds of antibiotics annually, compared to 3 million pounds consumed by humans. Factory farms — where thousands of animals are confined in their own manure, fed unnatural diets, and subjected to intense stress — are breeding grounds for new bacteria and viruses, points out PETA. Additionally, the antibiotics given to animals on farms are often the same as those used in human medicine, such as colistin – a “last resort” antibiotic frequently used to mass-medicate pigs and poultry. New research is revealing drug-resistance genes spread more widely and rapidly on industrial farms than scientists ever realized, says an article recently published in The Scientific American. “Antibiotics seem to be transforming innocent farm animals into disease factories,” writes Melinda Wenner Moyer. A necessity to keep them alive in their manure-gilded “homes,” antibiotics also help farm animals grow faster on less food, so their use has long been a staple of industrial farming, she says. Almost all U.S. dairy cows receive heavy doses antibiotics following each lactation to prevent and control mastitis. “It is now critical that agricultural use of antibiotics be recognized as one of the major contributors to the development of resistant organisms that result in life-threatening human infections,” writes lead author of the study Timothy Landers, professor of nursing at Ohio State University. Drug-resistant bacteria currently claim 700,000 lives a year, and health officials warn that that figure could climb to 10 million a year if we don’t limit antibiotic use. The link between factory farming and superbugs has been longer-recognized in Europe than the United States. In 2007, researchers in the Netherlands determined that at least a fifth of the MRSA infections in humans originated in farm animals. In 2008, the Dutch government introduced strict regulations to reduce farm antibiotic use. 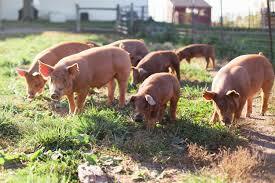 Denmark, another major pork exporter, had already banned the use of antibiotics in healthy pigs in 1999. When Tara Smith, a professor of epidemiology at the University of Iowa, heard what was going on in the Netherlands, she tested pigs for MRSA at a few Iowa farms. 70 percent tested positive. Smith and her colleagues have continued to publish a series of disturbing studies showing that MRSA is all over American hog farms, reports the Scientific American. They found MRSA growing in the nostrils of 64 percent of workers at one large farm and in feed at another farm before it even got unloaded from the delivery truck. Downwind of another farm, they found MRSA floating in the air. Research pinning factory farms as the source of antibiotic-resistant bacteria is limited in America, as farmers have been instructed by the large meat companies that own them not to let scientists on the property. Smith was lucky enough to have a veterinarian friend who got her access to several farms. They found antibiotic-resistant enterococci—which causes 20,000 infections in the U.S. every year—in the air inside of their cars, as well as resting on the top of soda cans in their cars’ cup holders. 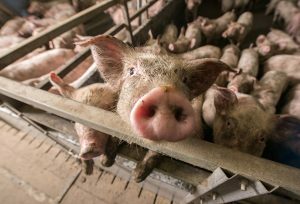 According to 2012 USDA data, almost 70 percent of American hog farms mass-feed antibiotics to their animals to prevent or control the spread of disease, more than 70 percent of feedlot cattle are fed medically important antibiotics, and around 50 percent of healthy chickens get antibiotics at some point. In a 2012 study, FDA scientists analyzed raw meats sold around the country and found that 84 percent of chicken breasts, 82 percent of ground turkey, 69 percent of ground beef and 44 percent of pork chops were contaminated with intestinal E. coli. More than half of the bacteria in the ground turkey were resistant to at least three classes of antibiotics. Animal poop is used to fertilize crop fields too, potentially contaminating much of our produce. 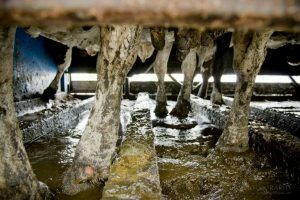 A 2016 study found that after manure from industrial hog and dairy farms was applied to soil, the number of antibiotic-resistance genes in the dirt spiked 400%. In a study in Pennsylvania, people who lived near crop fields treated with pig manure had a 30 percent higher chance of contracting MRSA. After her visit to a factory farm, Moyer, the author of the Scientific American article, visited a small farm where the animals were raised on pasture. Instead of asking her to put on a plastic coveralls and foot covers, the farmer at Seven Sons regenerative farm invited her right in. His anecdote has some research behind it. In a 2007 study, Texas Tech University researchers found that pigs that had been raised outside had enhanced bacteria-fighting immune cells compared to animals raised inside.